This school year our West Vancouver School District’s Student Support Services held a Professional Learning Series on “Reading Between, Above and Beyond the Lines.” In November, we were delighted to attend a session on “Accurate & Automatic Decoding and the Development of Phonological Awareness,” led by our Early Learning Principal, Sandralynn Shortall (@slshortall). It was a great opportunity to gather together teachers of the early years to hear the same key messages and district philosophy, and for consistency amongst common beliefs throughout our Primary teaching staff. There’s been so much talk and work done currently on inquiry based learning, coding, BC’s new education curriculum and our new report card format, that for Christy and I, it was almost a relief to return to one of the most essential aspects of schooling, particularly for parents and students: building on the Kindergarten child’s oral language skills before learning to work with print as a reader and a writer (McCracken and McCracken, 1996). As long-time Kindergarten and Grade One teachers, we know that the work we do now in literacy, during the early years, is paramount for our students over the long-term. We consider the term literacy to be inclusive of reading and writing so that whenever we refer to literacy, for the purposes of this and future posts, we mean both processes. Reading and writing influence each other: children need to know their letters when reading words, but they also need to know them when they’re writing and trying to spell. If we’re talking about just reading or just writing, we will refer to each process by its specific name. In our school district we conduct an early literacy skills assessment screener for our Kindergarten children at the end of January for our baseline information and then reassess in late May. We assess the children’s knowledge of alphabet names (upper and lowercase) and sounds, initial and final sounds of words, blending and segmenting skills, phonetic word reading, sight words and literacy awareness. In the time between the two assessments, based on the children’s initial scores, we know what areas we need to pinpoint for targeted instruction, and if additional supports beyond regular classroom instruction need to be brought in for our students. however, we also know from our own teaching and experience this is only one component of a balanced approach to reading instruction (which is one of our by-words), which also includes a rich oral language base such as read-aloud books and storytelling by the teacher; shared reading experiences of big books, rhymes, poems and songs with active participation by the children and independent reading of books by the children themselves. To take it one step further, a balanced approach to reading instruction is going to be part of the broader balanced approach to literacy, but that’s going to have to be a whole other topic for another day. Phonological awareness means the child is attending to the phonological or sound structure of language, distinct from the meaning of the words. Children with well-developed phonological awareness have the understanding that language is made up of sounds (phonemic awareness), syllables, rhymes and words (Trehearne, 2000). 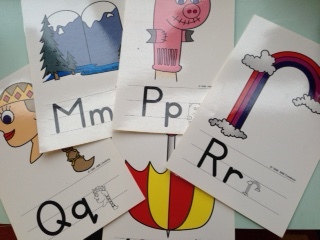 Phonics is the instructional approach for helping children learn the relationship between letters and sounds. Phonics is the relationship between the letters of written and spoken language. We often refer to it as the “sound-symbol” relationship. In Kindergarten, when we’re teaching the alphabet letters, and their sounds, how to blend sounds into words, how to segment words into their individual sounds and playing rhyming games, as teachers we don’t want to “squeeze” these activities into a few spares minute at the end of the day; rather, phonics instruction and other phonological awareness skills must be made a priority, and at a good time of the day when the children are attentive and ready to learn. It can be hard for excellent readers, which can include teachers, to understand what our students are feeling and going through when they struggle with reading. The children cannot hear the sounds as we do, and our brains are making the differences in meaning. Even in the simple rhyming activity we played today where some children had difficulty generating rhyming words for “lane,” offering words such as “land” and “lame,” we could tell that they had not discovered yet what is meaningful for them in terms of the sounds. A lot of children do not learn to read easily, or at least it does not come easily at first. And we need to think about how we are going to plan for those children in our teaching so that they can all become successful readers and learners. We’ve noticed not just amongst our students, but in our own families as well, that a rich language environment does not mean that being able to read is going to come naturally. There are specific skills needed to read, and the skills needed to link the sounds the language to the letters of the alphabet must be learned through cohesive, systematic and direct instruction. “Direct instruction” is often given a bad rap these days. For many, what comes to mind is children all sitting in rows, with the teacher at the chalkboard. Others see it where children are not allowed to talk, it’s just “teacher talk.” Some envision children working tirelessly, slate and chalk in hand, printing copious lines of letters, like we’re still in the Victorian age. There’s no play, no laughter, no inquiry, no curiosity. Well, direct instruction can and does involve a lot of play, and laughter and inquiry and curiosity…the difference is that we, the teachers, are directly teaching the concepts in a systematic way to the children, checking their learning to ensure they understand and made connections to that which they already know. We want to build on their prior experience; that’s why the shared learning experiences we have in class are so important so that we have a common base from which to build. Then, we try to build on their newly acquired knowledge, scaffolding their learning along the way, mastering concepts and moving on. Yes, sometimes the children have to sit at their tables or desk to complete their alphabet or literacy tasks. We’re not sure when that became a bad thing, because ultimately, it’s all about creating balance whether we’re talking about teaching or learning. In a balanced approach to literacy, we will have a greater opportunity of meeting the various learning styles and needs of all learners. Thank you so very much to our Principal, Valerie Brady, and our WV Early Learning Principal, Sandralynn Shortall, for their feedback in the preparation of today’s post.